This Stevens AeroModel version of the famous WWI fighter is a real head turner! 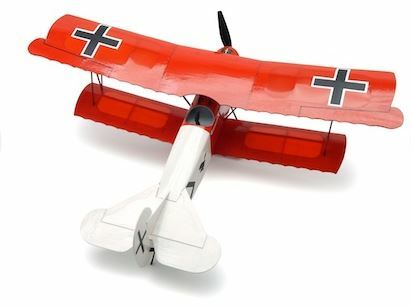 The micro-sized Fokker D.VII kit is designed on state-of-the-art CAD/CAM systems, and features design and construction techniques pioneered by Stevens AeroModel. A unique tab and notch construction technique makes for a quick and simple build, which will ultimately have this little Fokker ready for dawn patrol with haste! It’s docile flight manners and agile performance are noteworthy, and make it a worthy opponent to the companion micro SE5a also available from Stevens Aeromodel. Recreate the classic dogfights of the Great War in all of their miniature glory both indoors and out! Wing Area: 76 sq. in. Stevens AeroModel specializes in the manufacture and design of laser cut, electric powered, balsa and hardwood, RC model aircraft and boat kits. Stevens AeroModel products are designed, manufactured, and distributed in Colorado and are available direct from the manufacturer at 26405 Judge Orr Rd. – Calhan, CO – 80808 or on-line at www.stevensaero.com.